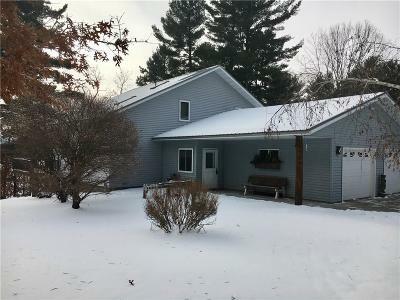 Beautiful chalet on northern Prairie Lake with access to the entire Chetek Chain of Lakes. Open concept home features 3 bed/2 bath. Beautiful custom hickory cabinetry, 1st floor laundry, family room with walkout to patio and lakeside yard. New steel roof 2017. Furnace and A/C 2014. Dishwasher 2018. Large 1.2 acre lot includes a 32x40 pole shed which is partially insulated with in-floor heat in workshop area. Whether it is fishing, enjoying water sports, watching the abundant wildlife, or just relaxing on the huge deck , you will love to call this place home! Located just 3 miles from Cameron. Directions: Hwy 8 East Of Cameron To Right On 22nd St. Continue To Stop Sign, Take Right And Follow To The Cul De Sac. Property On The Left Side.